Createspace Independent Publishing Platform, 9781466465220, 370pp. 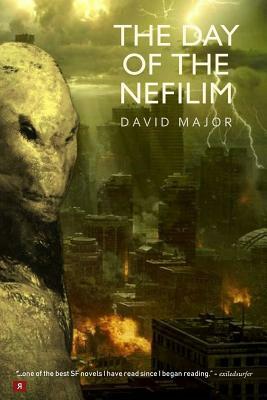 The premise of The Day of the Nefilim, David Major's debut novel, is simple: take a good-sized sampling of the most popular conspiracy theories and new age thought forms that the culture has to offer, put them in a blender, and hit the switch. "I love this book as much as I love all of my favorite science fiction books, and that's a quantity that defies quantifiers." "Strange aliens, end of the world scenario, weird flying ships, invisibility, ugly despot. Can't get enough of this stuff. Includes a great view of a better life beyond the war zone...."
"I've read a lot of SF and conspiracy theories in my time, watched thousands of SF movies and documentaries, but I've never come across anything like this " - E.V. The liquid and gas that had long since been frozen solid by the unyielding cold of the vacuum of space began to thaw. If there had been anyone on the planet's bleak surface to see, the approach to its star would have been greeted first with wisps of vapor as the atmosphere began to return to its gaseous state. Then clouds of mist formed, covering the entire globe in wreaths of swirling white. As the approach continued, continents of ice crumbled, disintegrating into the seas that had begun to form. Life that had been suspended in the death of absolute zero began to stir. Life cycles resumed as seed found sustenance in the chilled tundra, and creatures emerged from eggs hatching in the slight warmth of the sun. Spores drifted through the reconstituted atmosphere, seeking and finding refuge. Deep in the frozen earth, other processes were set in motion. Ice fell from hollowed, gaunt faces; deep black eyes flickered and opened. Muscles that had been as solid as ice for eons flexed and moved again. Tall forms moved through dark caverns.